NEW DELHI: The Bollywood movie, Special 26, made quite an impression on Nitin Sood, a zoology graduate. So much so, that he roped in his friends to enact it in real life. In the movie, a team of tricksters poses as CBI officers and conducts raids to dupe politicians and businessmen of their black money. With the real CBI on their trail, they decide to pull off their biggest heist. 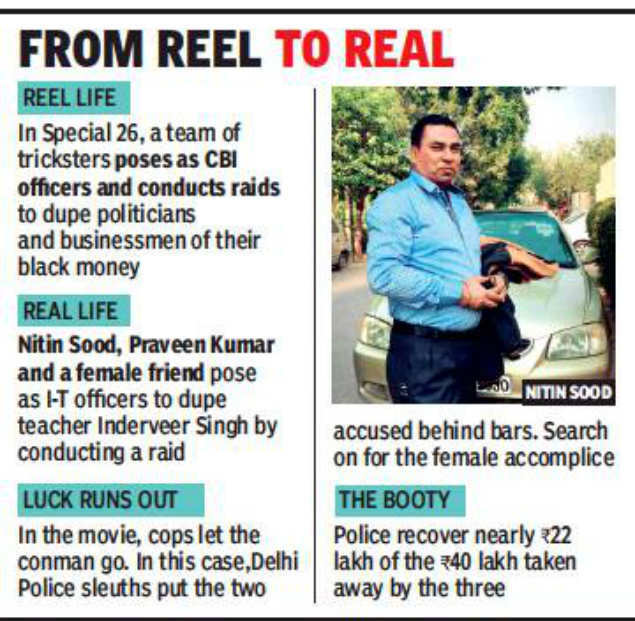 However, contrary to the movie’s ending where cops let the conman go, Delhi Police sleuths put them behind bars, 24 hours after they duped a maths teacher in west Delhi’s Rajouri Garden. Confirming the developments, DCP (west) Monika Bhardwaj said the other accused was identified as Praveen Kumar. Police also recovered nearly Rs 22 lakh of the money the accused had taken from the victim. The duo, along with a female friend, came to the house of one Inderveer Singh on Thursday morning and introduced themselves as officers from the income-tax department. The act was so convincing that Singh easily accepted their fake credentials. The gang told the teacher that they had information that he was hiding black money and were going to search his house. They asked Singh to open his safe. They collected around Rs 40 lakh and told Singh that the amount was being seized. The teacher was also threatened with legal action. Once the gang left, Singh got in touch with a contact in the income-tax department and informed him about the “raid”. To his shock, he was told that no such raid had been conducted. Singh then went to the cops. Subsequently, a case under sections of fraud was registered at Rajouri Garden police station. Police teams scanned CCTV footage from around the house for clues. They identified the car used by the gang. Using the information, they managed to round up the suspects within 24 hours. Probe revealed that the plan was hatched by Sood, who had executed a sensational Rs 90-lakh robbery at a jewellery showroom at Paschim Vihar four years ago. He had also sold the same property to multiple people in Shahbad Dairy and had been arrested in both cases. He planned the fake raid after getting information that the teacher kept a lot of cash at home. The gang then prepared fake IDs and badges. Some photoshopping, a few briefcases and smart suits did the rest. Police are now looking for the female accomplice of the duo and also the rest of the stolen money.